Don't let sushi chefs have all the fun. Turn the spreading, layering, tucking, and rolling into a party at home. There's no wrong way to make sushi: Depending on their dexterity and ambition, your guests can make traditional maki (rolls), assemble more free-form cones, or eat chirashi ("scattered-style" sushi) by piling the rice on their plates and topping it with the seafood and vegetable fillings. Here's an easy plan for a do-it-yourself sushi party for six people. Your part is to cook the rice, prepare the fillings, set up a rolling station, and make the salad (steps 1 through 4). Your guests' job is to roll and wrap away, an activity that gets more entertaining in proportion to the amount of sake they consume in the process. Round out the menu with items you can buy at an Asian market, like frozen gyoza (pot-stickers), edamame (soybeans) in their pods, miso soup from a mix, wasabi-flavored rice crackers, and some mochi ice cream balls for dessert. Nori (seaweed wraps), wasabi, and pickled ginger are available in well-stocked supermarkets and in Asian grocery stores. Traditional bamboo sushi mats make rolling easy, but sheets of plastic wrap work surprisingly well. 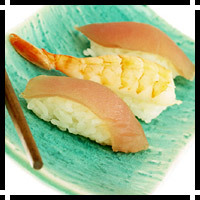 The mats, chopsticks, and rice paddles are available at Japanese markets, other import stores, and through www.cooking.com, www.mrslinskitchen.com, and www.pacificrim-gourmet.com. 1. In a small bowl, stir 3/4 cup rice vinegar, 3 tablespoons sugar, and 3/4 teaspoon salt until sugar and salt are dissolved. 2. In a fine strainer, rinse 4 1/2 cups short-grain white rice under cold running water until water runs clear. Drain for 5 to 10 minutes. Put rice in a 4- to 5-quart pan and add 5 1/4 cups water. Bring to a boil over high heat, then lower heat to maintain a simmer, cover, and cook until water is absorbed, 10 to 15 minutes. 3. Spread rice out in a shallow 12- by 16-inch baking pan and slowly pour vinegar mixture over it, turning rice gently and fanning it (the Japanese use a traditional fan, but you can use a piece of paper) until it comes to warm room temperature, about 15 minutes. Makes 9 to 10 cups. Choose five to seven items from this list of favorites. You can get them ready up to 4 hours ahead; chill airtight until you're ready to roll. Rinse 3 ounces sashimi-grade ahi tuna (yellowfin or bigeye; for bacteria safety, buy it from a good seafood purveyor); pat dry. Cut tuna into 1/4-inch-thick strips about 1/2 inch wide and 3 1/2 inches long. Just before serving, arrange raw fish on a bed of crushed ice on a rimmed plate. Place 2 ounces salmon roe in a wire strainer and rinse gently under cold running water; mound in a small bowl. In a small bowl, mix 8 ounces shelled cooked crab or drained canned crab (squeeze out liquid) with 1/4 cup may-onnaise and soy sauce to taste (about 2 teaspoons). Makes about 1 cup. Cut 3 ounces thinly sliced smoked salmon into 1/2-inch-wide strips. In a 5- to 6-quart pan over high heat, bring about 1 quart water to a boil. Snap off and discard tough stem ends from 8 ounces asparagus. Rinse asparagus and add to boiling water; cook until barely tender when pierced, 3 to 4 minutes. Drain and immediately immerse in a bowl of ice water. When cool, lift out and cut into 3 1/2-inch lengths. Pit and peel 1 firm-ripe avocado (8 oz. ); slice lengthwise into 1/4-inch-thick, 1/2-inch-wide strips about 3 1/2 inches long. Place in a bowl with 2 tablespoons lemon juice; turn to coat. Peel and shred 3 ounces carrot, or use 3/4 cup shredded carrot. Rinse 6 ounces Japanese or English cucumber; cut into 3 1/2-inch lengths. Cut lengthwise into 1/4-inch-thick slices, then stack 2 or 3 slices at a time and cut lengthwise into 1/4-inch-thick sticks. Trim woody stem ends from 3 ounces enoki mushrooms. Rinse mushrooms briefly, drain, and gently pat dry. In a 5- to 6-quart pan over high heat, bring about 3 quarts water to a boil. Add 6 ounces rinsed spinach leaves and cook just until wilted, 1 to 2 minutes. Drain and immerse in a large bowl of ice water until cool. Drain again and spread on a clean kitchen towel. Roll towel up and twist and squeeze tightly to remove as much liquid as possible. Gently rinse and drain 2 oz. (1 1/2 cups) radish or broccoli sprouts; trim off root ends, if present. Arrange sushi components on the table, or set up a station on a nearby counter. 1. Mix 1/4 cup rice vinegar with 4 cups water. Pour into small bowls for guests to moisten their hands while rolling sushi, so rice doesn't stick. 2. Put 6 precut sheets of nori (7 1/2 by 8 in.) in a covered serving container to keep dry; mound sushi rice and fillings on platters or in bowls (vegetables together, seafood separately). Put condiments--soy sauce, pickled ginger (1 cup), and wasabi (about 3 tablespoons prepared wasabi or 4 tablespoons powdered wasabi mixed with about 2 1/2 tablespoons water)--in separate bowls. 3. Arrange ingredients, along with bamboo mats or plastic wrap, on the table or station. 1. Rinse shrimp; drain well. Cut in half lengthwise. Thinly slice cucumbers. 2. In a bowl, mix vinegar, sugar, and soy sauce. Add cucumbers and shrimp; mix to coat. Top with peanuts just before serving (see notes). Per serving: 115 cal., 35% (40 cal.) from fat; 11 g protein; 4.4 g fat (0.7 g sat. ); 8.7 g carbo (2 g fiber); 200 mg sodium; 74 mg chol. Here are two different styles of rolls to try--the traditional maki and the free-form hand roll, which is even easier. 1. Place a sheet of nori, shiny side down, on a bamboo rolling mat (with slats running parallel to you) or a piece of plastic wrap (about 10 by 12 in. ), aligning nori with the bottom edge of mat. Dip your hands in vinegar-water mixture and scatter 1 1/2 cups rice over nori; pat into an even layer, spreading out to the sides and bottom of nori, but leaving a 2-inch-wide strip bare along the top edge. 2. With your finger, spread a thin stripe of wasabi horizontally across center of rice. Arrange three or four sushi fillings along wasabi stripe (A; it's okay if some ends stick out). Moisten top edge of nori with vinegar-water mixture. Holding fillings down with your fingers, lift edge of mat closest to you with your thumbs (B) and roll it over so that the near edge of nori meets the far edge of rice. Roll over to seal, and briefly press mat around roll (C). 3. Remove roll from mat. If desired, trim off any filling sticking out. With a sharp knife, cut roll into six or eight equal pieces (D), rinsing knife in water between cuts. Per piece of crab, avocado, and cucumber roll: 133 cal., 15% (20 cal.) from fat; 3.2 g protein; 2.2 g fat (0.4 g sat. ); 25 g carbo (0.4 g fiber); 162 mg sodium; 7.2 mg chol. Per piece of smoked salmon, asparagus, and carrot roll: 112 cal., 2% (2.7 cal.) from fat; 2.3 g protein; 0.2 g fat (0.1 g sat. ); 24 g carbo (0.4 g fiber); 126 mg sodium; 0.5 mg chol. 1. With scissors, cut nori into quarters (about 4 in. square). 2. Dot a square of nori with wasabi if desired, then spoon a rounded tablespoon of sushi rice diagonally down the center. Top with two or three sushi fillings (A). Moisten one corner of nori with vinegar-water mixture, pull opposite corners around fillings to form a cone, and overlap to seal (B). Copyright 2019 Sunset Publishing Corp.